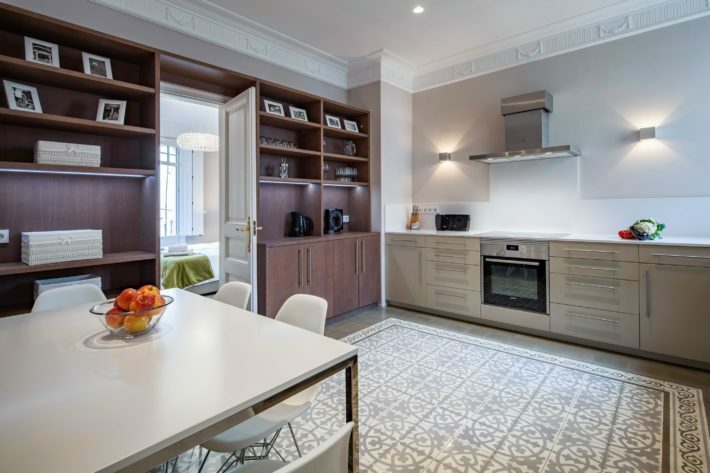 Set in the central and tranquil area of Barcelona, equipped with the most stylish and modern decoration, Barcelona Premium B apartment is on the list for the featured apartment of July. Over three years of customer review, this luxurious apartment is excellently rated with 9.8/10 score. The Eixample is certainly an elegant part of town. Its buildings are beautiful, there are luxury boutiques and exclusive restaurants. During the day the area is buzzing with activity; people, offices and shops, whereas at night it is a calm place. 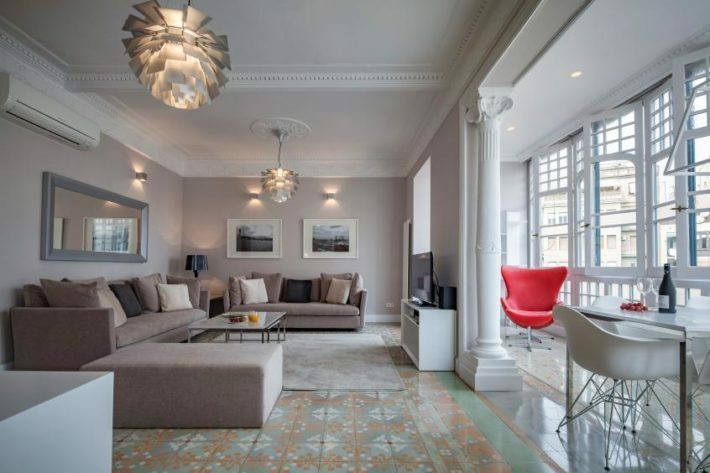 One of the most emphasizing attributes of Barcelona Premium B apartment is the living room. The spacious living room comprises two large and comfortable sofas and a working desk, designed in an open style. Next to it is a gallery with a dining table for 6 people and a large glass window. During the day, the living room is flooded with natural light. If you are a social person, this lovely living room is absolutely an idea for chilling evenings with your beloved and friends. The fully equipped kitchen is perfect for cooking with induction hob, oven, extractor hood, fridge, freezer, dishwasher, microwave, toaster, kettle, coffee machine for filter coffee and Nescafe Dolce Gusto capsules. Dishes, cups, glasses, pots and pans in different sizes could be found. Besides the dining table in the living room, there is another dining table of four here. The apartment features an ensuite bathroom inside the master bedroom with a shower, a double sink and a toilet. Another separated toilet could be found on the other side of the apartment. 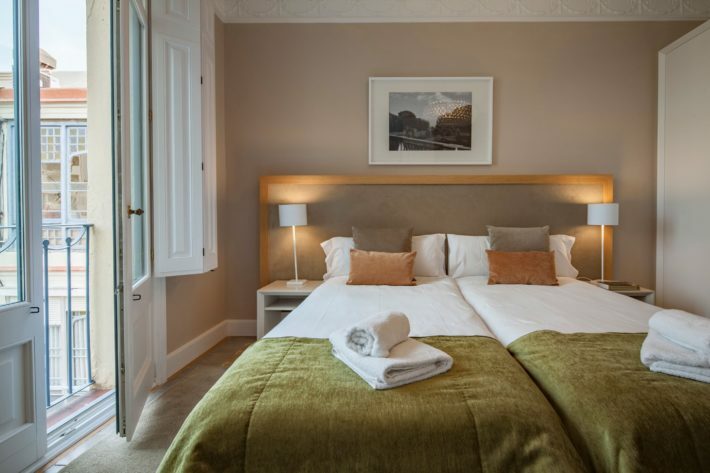 To comfort your stay, Barcelona Premium B offers two double bedrooms with two twin beds that could be combined together or separated apart easily by few steps. Each bedroom is equipped with a high-quality mattress and a wardrobe. Additionally, the apartment is equipped with a flat-screen TV, central air conditioning and heating, safe box, free and fast 10 Mbit WLAN, stereo with radio and CD player with a connection to your smartphone. La Pedrera – 0.45 km. 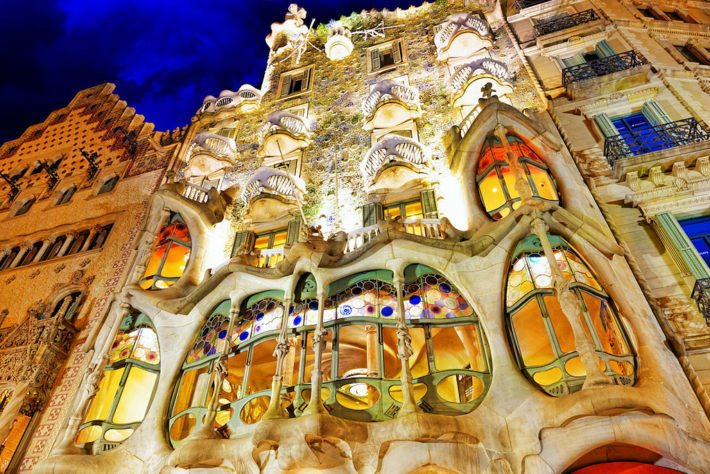 La Pedrera, which is also known as Casa Milà became a World Heritage site by the UNESCO in 1984. This is the building Antoni Gaudi worked on, before he completely dedicated himself to the Sagrada Familia. Casa Batlló – 0.68 km. Casa Batlló, which is now owned by the Bernat family, the former owners of the Chupa Chups company, was built in 1877 and in the years 1904 to 1906 restored and remodeled by Antoni Gaudí and Josep Maria Jujol. "We (family with two children) have just refurbished, spacious and luxurious apartment found that a lot of space and comfort has commanded. The stylish furniture is perfectly color-matched to the wonderful old tiles. Each room features old, well-refurbished stucco ceilings. In the morning we had breakfast in the sunshine in the beautiful conservatory. The kitchen is very well equipped. There is even a fridge-freezer with ice and water dispenser. The location is central but still quiet. Diagonally opposite the house, there is a bus stop. Taxis can be stopped at any time outside the house. The nearest underground station is located on Passeig de Gracia, the main shopping street, which is only 3 blocks away. In the immediate vicinity are several small supermarkets, bakeries and restaurants. We have enjoyed the stay and would love to come to the apartment to Barcelona back." – Andrea B., group of friends. Book a night in Barcelona Premium B now or visit Habitat Apartments for the full list of holiday apartments in Barcelona.